1 Blemished Available: $206.96 This item is available as a Blem/Refurb. These are items that cannot be sold as "New" merchandise and are limited to stock on hand. See the product details for a description of the product's condition. The Dainese Tempest D-WP Boots are an all-round touring boot that doesn't hold you back when you want to hop off the bike and stretch your legs. Certified to CE Cat. II, the Tempest Boots not only offer superior protection, but also include a D-WP waterproof liner and flexible joints that eliminate the "storm-trooper" effect when you need to walk around off the bike. Bought these boots April 2017, and was initially really pleased. That lasted 16 months only, when the left boot was no longer waterproof. First long trip (2100 miles, June 2017) boots performed well indeed, including through heavy rain. But this August, caught in the rain in PA and later in VT, on a 2500 mile trip, the left boot soaked through in minutes each time. I had expected more from boots at this price point. Don't buy, unless you plan on avoiding rain after the first 12 months of use. Many days of research concluded that this particular boots from Dainese would be best for the normally high temps in Arizona. Gore-Tex is not a viable necessity since this is the dry desert and rain is always a scarcity. I have wide feet and liked that the review from Revzilla mentioned more than ample toe room. 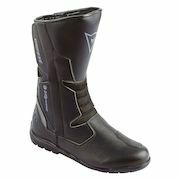 Also, I am not a road racer and was looking for boots with both style and comfort, Dainese always provides both. Can't wait to try them out on my FJR1300!!! Because it the largest boot that Dainese make that looks good!! Can this boots use inside the riding pants without adding to much bulk? BEST ANSWER: My Dainese Pony C2 perforated leather pants fit inside these boots without too much bulk.